In downtown Prague, a stone’s throw from the city’s old town district, Warhorse Studios are working on an RPG. It might be the most interesting RPG anyone’s tried to make for years. Related: try these best-in-class RPGs. 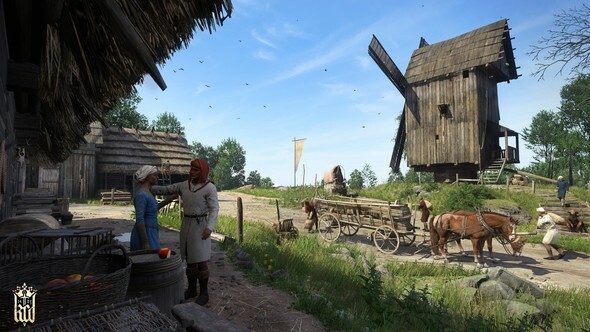 Kingdom Come: Deliverance is so dedicated to – so fixated with – the idea of recreating a particular sixteen square kilometre patch of 15th century Bohemia that they’ve hired historians on a full-time basis to advise them about every single detail. We’ve all heard that said in countless press releases about countless games, but this is different: it’s a level of attention that extends beyond weapons and armour to the vegetables that would have grown in that area, what the farmers who grew them would have worn, and the exact buildings they lived in. “It’s kind of a gap in the market because nobody has done it before,” says PR manager Tobias Stolz-Zwilling. “At least not as an RPG.” The best RPGs often craft their worlds impressively enough that you forget they began as a figment of someone’s imagination, but of course that’s exactly where The Witcher 3: Wild Hunt, Skyrim et al were born. 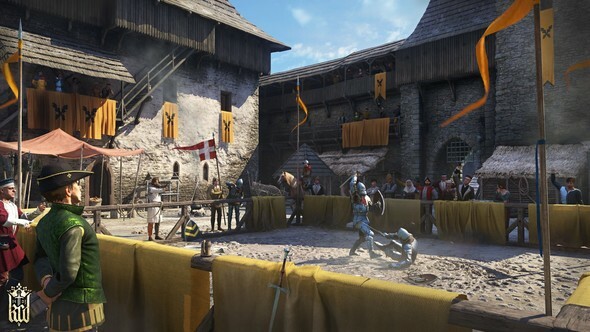 Kingdom Come: Deliverance is diametrically opposed to fantasy: it finds everything, from its visuals to story and quest design, in the history books. “Most of the NPCs really lived, and all of the buildings really existed,” Stolz-Zwilling says. And that in turn leads to Hitman-like scenarios in which the clothes you’re wearing grant you certain access rights and privileges. For example, “there’s a part in the game where you have the option to infiltrate the monastery,” Jirsa continues, “and you actually experience the life of those monks.” The designers had been talking about a monastery section excitedly when the historian stepped in and told them there was simply no way anyone but a monk would be allowed to enter such a building in 1403. “So,” says Stolz-Zwilling, “the design team had to think about reasonable excuses or reasons for why the player could go inside the monastery.” The nature of the quest was decided on those terms. Rather than making clothing and social etiquette work like historically accurate set-dressing, Warhorse found gameplay in it. Their ultimate aim is a world in which every action performed by the player elicits the appropriate response from the game world; a world of men, women and children all with their own homes and routines, who rise and go to bed at certain times, and notice what you’re wearing. The aforementioned armour-wearing NPC might look a bit dastardly, so you might be inclined to bribe him instead. Then again, you might know that he’s a royal, which would also colour that decision. It’s a system designed to avoid the kind of “failed, failed, failed, succeeded” feedback common in deep RPGs laden with this many mechanics. And it’s that bit more exciting for being an interaction with someone who did once live in the area being depicted, not some potato-faced auto-generated character. The other aspect of Kingdom Come: Deliverance’s aversion to fantasy also has a profound effect on gameplay. In the kind of role-playing game that indulges in stone gollums and enchanted breastplates (see: all of them) you inevitably end up in a quasi-immortal state, bestowed with powers that can extinguish all life within a town’s radius with a swish of your floppy hair. Such an end state just isn’t compatible with the tone and ethos of Kingdom Come: Deliverance. If the entire project’s based on summoning a time and place from the past, it’s pretty important for Warhorse to choose a setting that’s actually worth summoning. The aforementioned stretch of Bohemia is the village of Stříbrná Skalice, located 50km south of Prague. It was well-known for its rich mining veins of silver in the 1400s, and in 1403 King Sigismund of Hungary invaded the region, with that silver glinting in his eyes. It’s Sigismund who occupies the role of chief antagonist in Kingdom Come: Deliverance. To rebuild their own Stříbrná Skalice, Warhorse started with satellite maps of the area, digitally reconstructed constructed the buildings of the era, and massaged the geography just slightly to make for a more enjoyable space for the player, an “adjusted realistic map” as Stolz-Zwilling puts it that “moves the villages and cities a bit closer to each other to make it more densely populated and [makes] the forests a bit smaller.” It avoids the majority of your quests involving a necessary 10km trek across historically accurate and utterly barren grassland. However, the resulting game map is accurate enough that Warhorse could find their way around when they visited the real locations for field trips. With all the love and attention that went into this inviting, at times even chocolate box, vision of 15th century Bohemia, it’s slightly unnerving to see so many players killing literally everyone they see in the alpha build. Not altogether surprising, of course, but you’d imagine slightly at odds with the way Warhorse wants you to play. You’d imagine wrong. Warhorse Studios have plenty of first-time developers in their ranks (this will be Jirsa’s first title, having cut his teeth in RPG modding for years), and perhaps that goes some way to explaining the game’s grand ambitions. But in studio co-founder Daniel Vávra it has an individual with a singular talent for letting a time and place tell the story. Vávra’s first credit in the industry was for his texture work on Hidden & Dangerous at Illusion Softworks. It’d be a stretch to say he influenced the game’s storytelling, but perhaps he soaked in a bit of Illusion’s ethos while they made WW2 feel like a series of personal, small-scale conflicts against unforgettable – if remarkably buggy – backdrops. Mafia: The City of Lost Haven, on which Vávra served as game director, screenwriter and lead designer, is a striking example of the value historical accuracy can bestow on a game. The titular city is a time capsule that evolves over the span of its story and ticks off all the gangster movie beats you could wish for in the process. A neat trick for 2002. Mafia II took that idea and ran with it, giving its Empire Bay a facelift to depict over a decade of time passing. Songs on the radio changed, architecture evolved, cars moved on. Whatever your misgivings about its mission design, or how it used that enormous space for minute-to-minute gameplay, the way 2K Czech used it as a storytelling device was absolutely exemplary. So it is, it appears, with Kingdom Come: Deliverance. We’ve reached the end of the era in which simply telling us we can go all the way to that mountain on the horizon is impressive. We need some kind of meaning to the giant spaces that games now occupy, and by grounding theirs in some of the most rigorous historical accuracy ever seen in an RPG, Warhorse might be onto something that endures the ages.